Runners mark your calendars! Registration for the 2019 Kentucky Derby Festival miniMarathon and Marathon presented by Humana opens on Wednesday, September 12, at 9:00 a.m. EST. The Festival is kicking off registration at DerbyFestivalMarathon.com with 24 hours of deals which include: the lowest prices of the season, discounted VIP rates and deals on race gear. Plus, the Festival’s Race Referral Program returns, which could earn runners free registration for the 2019 event. Runners mark your calendars! 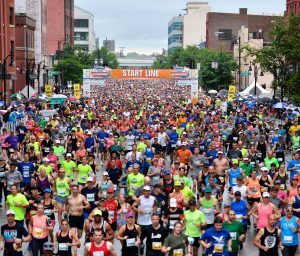 Registration for the 2019 Kentucky Derby Festival miniMarathon and Marathon presented by Humana opens on Wednesday, September 12, at 9:00 a.m. EST. The Festival is kicking off registration at DerbyFestivalMarathon.com with 24 hours of deals which include: the lowest prices of the season, discounted VIP rates and deals on race gear. Plus, the Festival’s Race Referral Program returns, which could earn runners free registration for the 2019 event. The Kentucky Derby Festival is underway and the Kentucky Exposition Center plays host to four popular events. 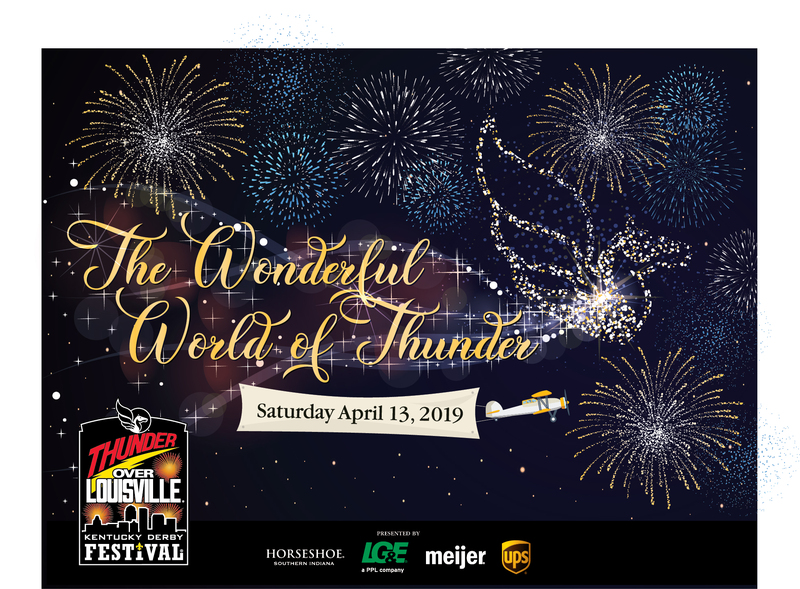 Kentucky Derby Festival Race Expo & Packet Pick Up: Thursday, April 26 – Friday, April 27 4 p.m. – 8 p.m. – Thursday 11 a.m. – 9 p.m. – Friday More than 15,000 Kentucky Derby Festival Marathon and miniMarathon participants and their families stop by this annual event to pick up required information for the two races. During this time, attendees can visit exhibitors featuring fitness resources, tools and apparel. Located in the West Wing and Pavilion. U.S. Bank Great Balloon Glow: Friday, April 27 6 p.m. Gates open 9 p.m. Glow begins Spectators watch as pilots fill hot-air balloons that glow against the evening sky, set to a special musical score. Visitors are invited to meet the pilots and ask questions. The balloons are parked in Lots C and D.
Thorntons Great Bed Races: Monday, April 30 4 p.m. Official tailgate party 6 p.m. Parade of the beds 7 p.m. Races begin Crowds cheer as teams dressed in costumes push decorated beds in a 600-yard dash to the finish line. Awards are presented for fastest course times, best decorated, most entertaining and more. The races take place in Broadbent Arena. Republic Bank Pegasus Parade Preview Party Presented by Mega Caverns: Tuesday, May 1 5 – 9 p.m. Open to the public Visitors get a sneak peek at inflatables and floats, complete with dancing costumed characters. Children can also get an autograph or photo of the Derby Festival Queen and Royal Court. The preview party is held in South Wing C.
Admission to all events is free with a 2018 Kentucky Derby Festival Pegasus Pin. Parking at the Kentucky Exposition Center is $8 per vehicle and $20 per bus. For more information about the Kentucky Derby Festival, visit www.kdf.org. With the traditional spin of a wheel Tara Dunaway of Leitchfield, KY, was named the 2018 Kentucky Derby Festival Queen at the 60th annual Fillies Derby Ball at The Galt House. Tara, 21-years-old, is a Junior at the University of Louisville where she is majoring in Business Marketing with a minor in Management. She is a College of Business Student Council Member and serves as the Chairman of Outreach, has been named to the Dean’s List multiple times, and has studied in numerous countries including England and Austria. Tara also volunteers at Portland Elementary and has participated in mission trips to Central America. This year’s Republic Bank Pegasus Parade will be a blast from the past for Festival fans. Festival officials announced the Grand Marshals and set the line-up for the parade at a special event tonight at Mark’s Feed Store. In honor of this year’s parade theme “ThrowbackThursday,” former coaching rivals and basketball fan favorites Joe B. Hall and Denny Crum will serve as the parade’s Co-Grand Marshals. It’s a familiar role for the coaches who also participated in the 1975 parade. In addition to announcing the Grand Marshals, floats and inflatable units participating in this year’s parade drew for positions for annual march down Broadway. This year’s theme of “ThrowbackThursday,” will be used by sponsoring companies to help direct the building of floats and costuming of the inflatable handlers and crew. Participants were invited to pick their favorite parade themes from years past to decorate their units. The floats and inflatables compete for various awards based on originality, eye appeal, theme representation, animation, attention to detail and enthusiasm. Marching bands use the theme to help with musical selection and it is the basis of costume and concept design for the other marching units. The 2018 Parade will feature 10 floats, many of them built by the employees of the companies sponsoring them. The following companies drew for their float position in the parade at tonight’s event, as well as the sponsors of the five participating inflatable character balloons. 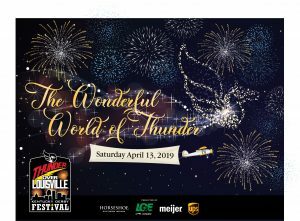 Before the parade, fans can see the floats, inflatables, equestrian units and much more on display at the Pegasus Parade Preview Party Presented by Louisville Mega Cavern on Tuesday, May 1, at the Kentucky Exposition Center, in South Wing C. Admission is a 2018 Pegasus Pin. 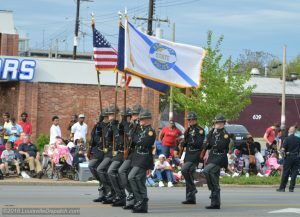 Tickets for the Parade are on sale now online at KDF.org. Ticket prices are $10 for bleacher seats, $12 chair seating and $30 VIP seats. Republic Bank is the Title Sponsor of the parade with Contributing Sponsor, KentuckyOne Health. Official Hotel: The Galt House.